If your home or some areas of your home have been bugging you or has been an item on your wish list that you have tended to push off for a long time there is no better time than now to bring it back up to the top of your list and create a solid, strong action plan that will enable you to turn your wish list into a reality. Establish a Budget - How much can you currently allocate on each project without feeling overly stretched. What financial resources are available to you? Savings, line of credit etc. Set Your Priorities - What areas are causing most difficulties or need most improvement from an aesthetic or functional stand point. Determine Best Timing - When will be the best time to get started with the project and changes? Whom will be in charge of managing your project? - Do both parties agree? it is something you both want to be in line with not to create or cause friction or added stress. Who will make most decisions or be the point person? It is important to establish ahead of time to prevent added pressure. 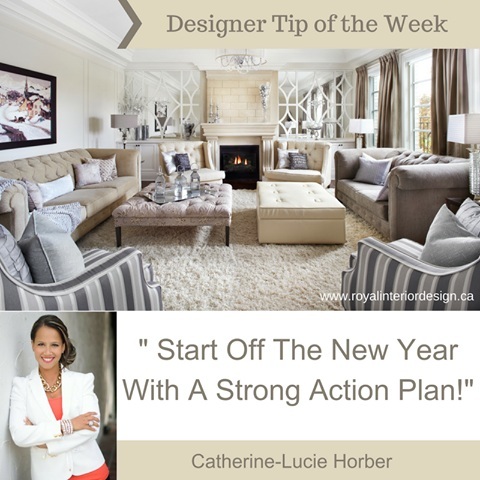 Make it Fun and Enjoyable - Any changes or renovation or new design transformations can cause stress if not properly planned and prepared for. Find a way to make it exciting, focus on the end result and the reasons you are wanting to make the changes and how it will both benefit you in the end. It is an investment and something you should both try to make a FUN experience. Working with an Experienced Professional - As many ideas as you may have and good intentions, often, it is either a lack of time or lack of resources or even confidence in what is best to do or not that may be making you feel unsure about what decisions to take in your design plan. We love helping and enabling our clients to create spaces that they love and dreamed of but might not have necessarily been able to achieve on their own. We work with our client's ideas, listen to their needs and wish lists and provide solutions that are both functional and beautiful for them. We can help you from A-Z or simply a consultation session helping you with an overall plan and direction for the DIY. Whatever your preference might be, we will be happy to help you kick off the New Year on the right foot!